The "Merlin" or Double Down - is two steps down from a surfer's short board. The "Merlin" excels in small waves. This design blends speed and maneuverability in a very short board. The short length allows the surfer to take a "full swing" at their turns in small - undersized surf. This design extends short board performance into the smallest conditions imaginable yet holds it's own in moderate sized surf. The length of this board depends on the size and fitness of the surfer. 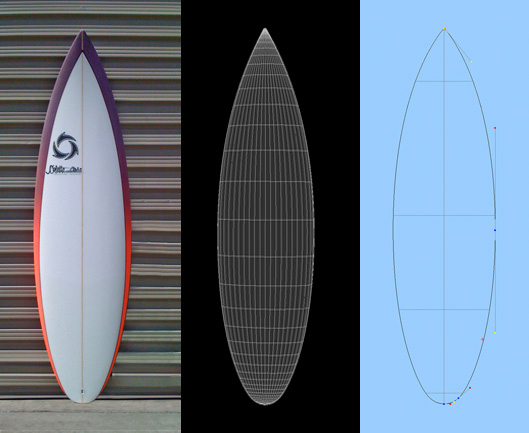 "Merlins" are designed 2" to 4" shorter than a pure short board and should range from 2" shorter to 2" longer than the surfer's height. The width should be 5/8" to 7/8" wider than their short board - the thickness moderately thicker than their short board. Primary design features of the "Merlin" are extra width and surface area, a flatter deck and fuller rail than the Redtail Pocket Rocket and the Peregrine. The "Merlin" features the same bottom contours as the Peregrine - single concave entry and wide point to deep single concave through the fins or optional single concave entry and wide point to deep single to double concave through the fins. The single has a little more lift and speed and the single to double has a little more control. Rocker, outline, bottom contours, profiles and rails are fully integrated to maximize performance.